Families Forward Charlotte cannot thank you enough for your generosity and support throughout 2018. With your contributions, we were able to help 25 families in the Charlotte community. Your support allowed us to provide these families who are experiencing poverty with Christmas gifts, meals, essential baskets, educational workshops, financial aid and personalized support. It’s not too late! While 2018 has come to an end, there is great need for your contribution in 2019. Click HERE to donate to help families like the one in the video to the right. 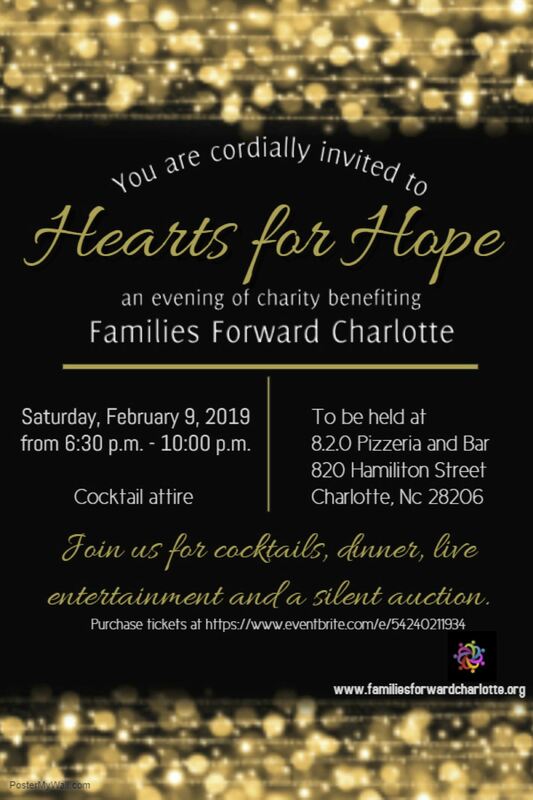 Please join us for our Second Annual Hearts for Hope event, an evening of charity benefiting Families Forward Charlotte. This year’s event will be held at 8.2.0 in the Music Factory. Your ticket includes heavy hors d’oeuvres, beer and wine, a silent auction, a live DJ, and an amazing program. Proceeds from the event will go directly to making a difference in the lives of the families we serve in the Charlotte community. Seating is limited, so take advantage of the early bird pricing and click HERE to get your ticket today! Click on this link to see Keisha and Jacob share a sweet "Thank You" to Families Forward Charlotte.